Your Kawasaki KLX110 deserves to be treated with respect, which means buying replacement KLX110 parts that are high quality and not just cheap, imported knockoffs. 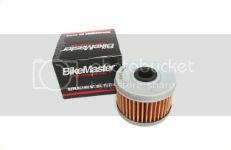 You'll see we're offering two grades of oil filter for the KLX110: the EMGO filter is designed to fit KLX110R, while the BikeMaster filters will work for the standard KLX110, the R model and the L model too. The sale price on the EMGO is currently 30+% off, making it a great buy, and shipping anywhere in the U.S. is still included. If you're looking for Kawasaki KLX110 performance parts, check through the individual subcategories outlined on the top of the page on your return visits to the site. Remember also that we are constantly expanding our inventory by adding new items as we go along. We hope to have the opportunity to serve you at least one time, even with a modest order, so we'll be able to dazzle you with our high-quality products, expert service, attention to detail and great money-saving opportunities. Whether you need a carb rebuild kit, lower shock bearings and seals, swingarm seals and bearings or a new clutch cable, we hope you'll find these items here and come back for more!